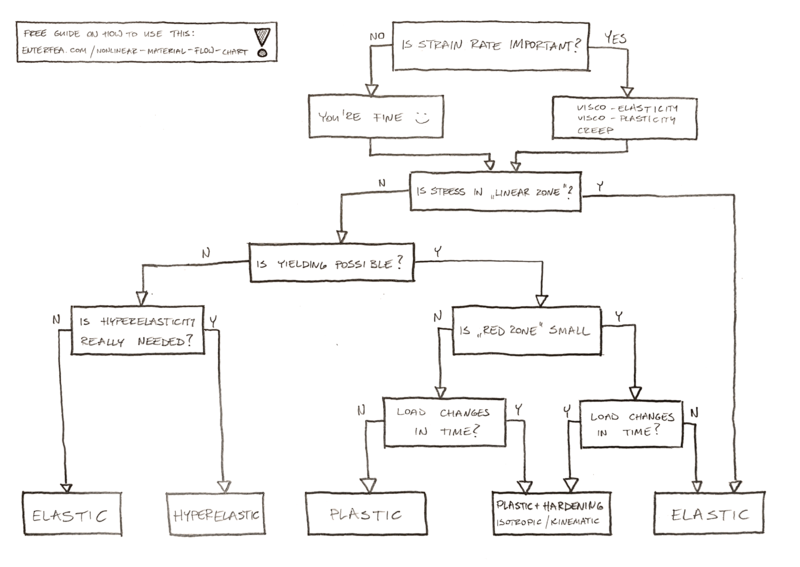 Flow Chart: Do I need nonlinear material? Download the printer-friendly version here, and read the user guide below! Last time I’ve shown you the way to answer a question: do I need nonlinear geometry? Today we will tackle nonlinear material. In the beginning, I need to confess, that I do mostly FEA about steel and other metals. This means that some nonlinear aspects of material are beyond my experience. I have studied some books, but couldn’t find materials that would explain to me how stuff works (apart from a shitload of long equations). If you know any resources on that topics (without complex math!) let me know! The first question is a hard one! Is the strain rate important? This is something we have to deal with from the start. You may have heard, that some materials exhibit different properties depending on the “speed of the load”. Even steel shows viscous properties if strain-rate (aka “the speed of the deformation”) is very high. What “very high mean” will greatly depend on the material you use. As far as I know, for metals very fast means small fractions of a second. In other words, if you have a “static load” you can answer “no” to this question (with a small reservation that will come later). What is important is that it “impacts” even materials with small stresses. It more or less acts as if Young’s modulus was different (higher with higher strain rate). 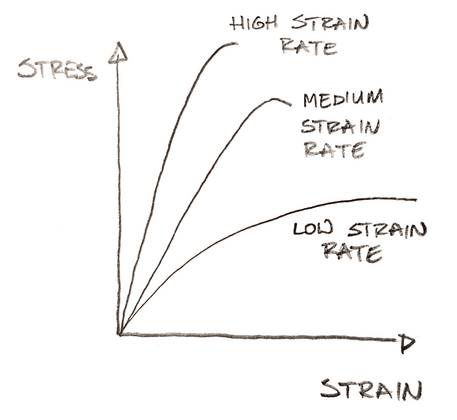 Also, this can lead to material taking far higher stresses than yield if strain rate is fast enough. There are many models connected to this. 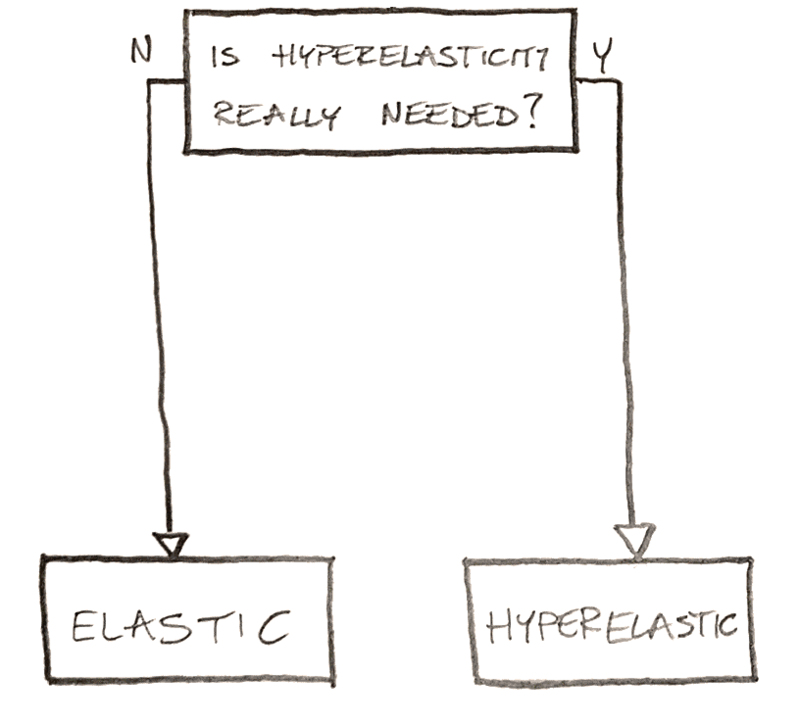 You can have visco-elasticity or visco-plasticity. It is also connected with creep, but I’m foggy about the details here. The small reservation is for concrete and similar materials. They exhibit creep, even if the loads are constant. Which means there is a kind of creep that is happening even if the strain rate isn’t “very high”. Is stress I get in “linear zone”? Straight to the finish line right? Let’s face it, whatever material you use (or at least I use) it has a “linear zone”. You know – the place where stress is linearly dependant on the strain. 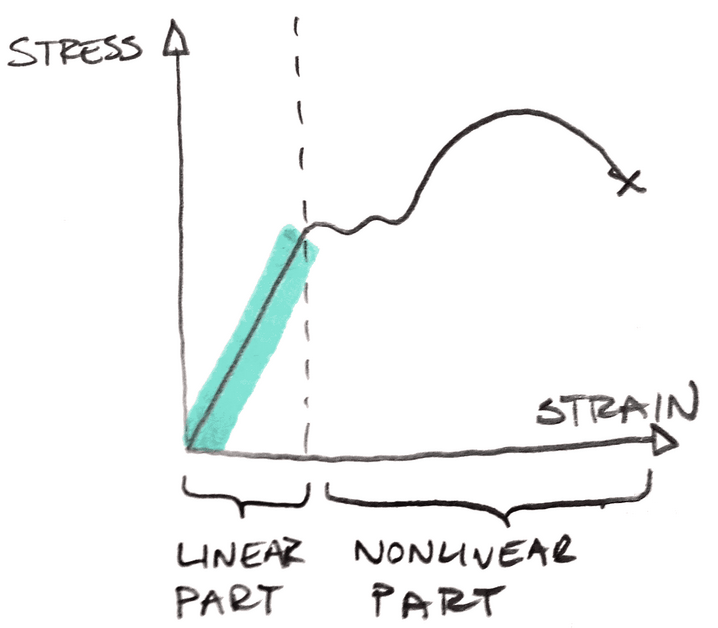 If stresses are so low that everything “fits” into the “linear zone” just ignore nonlinear material analysis! Unless there are other things at play (like strain rate dependency or creep) you are just fine! In such cases use elastic material and be proud about that! Time to yield… or is it? If you pulled a shorter stick, some stresses you obtained from the linear analysis are higher than the “linear zone” allows. You and I both know that this will happen! Otherwise, there would be no point in you reading this, and me writing this all (maybe apart from the fact that I enjoy this anyway). Is yielding possible for my material? You know, steel can yield. Rubber doesn’t. This is a rather important difference. Depending on the answer we will follow 2 different paths here, but we will struggle with similar questions as you will learn in a second. Sadly, if you don’t know if your material can yield I can’t really help you. Try to google the answer and ask around. This is something that is “beyond FEA”. In worst case scenario you will actually have to make some tests to check if the material yields. FEA can’t help you here – this is something you need to know as an input! I admit that I use “red zones” mockingly, but hey! What I mean by them is the place in the structure with stresses higher than those in the “linear zone”. This is usually associated with areas with stresses higher than yield in steel structures. Most FEA post-processors mark such areas in red, hence the “red zone”. Sometimes such zones are “huge” and you already know that this will play a role. In such cases, you need a nonlinear material. Is this “red zone” small enough to be ignored? 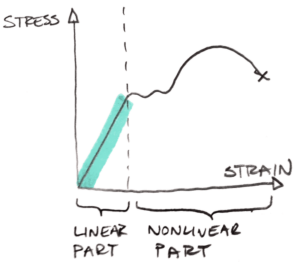 If there is stress higher than “linear limit” (i.e. yield) use the nonlinear material. This actually works and oftentimes is my default approach! However, the world is never black and white, right? It is clear, that if you have the stress a bit higher than yield in one node over a stiffener this is not an issue. The material will yield there a bit, and as long as you don’t have to worry about low cycle fatigue you are just fine. On another hand, if stresses on the entire model are higher than yield, the model will fail. As always, there must be a borderline between those 2 states. A “size” of the red zone that is “allowable” and a bit bigger size is no longer ok.
Usually, to check this, you do nonlinear analysis (it was made just for that!). But if you are far away (or at least far enough) from the borderline “red zone size”, maybe you can ignore the “small red zone” based on linear static. Is “red zone” small enough? Set “house rules”. Do the linear and nonlinear analysis of typical problems you solve. Then check what is acceptable and check what “linear stress” shows. I admit I would apply an “in-house” safety factor for such approach. But if you do a lot of repetitive models this may be reasonable! Think about it this way. If you are doing a 100th similar model, you did a lot of experiments already. Assume that before all models were ok in nonlinear analysis (and you also checked stress in the linear analysis). Now you only do linear run… and get linear stress that looks “as always”. It’s reasonable to assume that nonlinear analysis will turn out all is fine! Load that changes in time – we will discuss this in a second. The red zone is big. This is a bit tricky. Think about it this way. Your model is stable (you got results that converged). This means that stresses are somewhat in equilibrium with active forces (actually the work is in equilibrium but that is irrelevant). In reality, the stresses in the red zone won’t be higher than yield… they will be equal to yield (and plastic strain will increase). This somehow “invalidates” the equilibrium. In order to get it “correctly”, the structure would push the stress out of the red zone to nearby places… creating a bigger yielded zone. If the area is so big that it can cause plastic failure… well you need a nonlinear material! To add perspective this is a yield zone that causes failure in two models I did before: Of course getting near a zone this big in the linear analysis would be a suicide! But I have met so many people that fret over a “red zone” of a size of 1 Finite Element in the above models! I show them simply to put things into perspective. Read books and guides/rules: I admit I never did that, as I quickly moved to nonlinear domains. However, if you are (or know) a stress analyst, they most likely have a thick book or a code. You can read there how big stress is allowable and where. I never liked learning such rules by heart, but this is certainly a way to deal with such problems. However, if you are about to start learning that… I would highly recommend learning nonlinear analysis instead. In my opinion, it is less work and more “bang”! If you feel that one of the methods above “speak to you” then try to use it. Just be sure to understand what you do, before you ignore the high stress simply because this is an “FE error”. Sadly this is a common philosophy, and I wouldn’t go that route! If you don’t feel confident in using those tools I completely get you. I also prefer to do the nonlinear analysis… just to be sure! In such case always say “no” to this question and move on! Will load change in time? This is to gauge, if low cycle fatigue will be a thing, or do you need to worry about hardening at all. There are few cool phenomena here, but this is a topic for another post I think. You can always read this awesome post by Ajay! For now let’s acknowledge, that if you yield material in compression, this also changes how it will react to tension (and vice versa). There are 2 approaches to this. One is that material will strengthen in both compression and tension (this is called isotropic hardening). The other is, that if you strengthen in tension, you will get weaker in compression. Such thing is called Bauschinger effect and is covered in kinematic hardening. In other words, if loads will change in time (especially from compression to tension) you simply have to take that into account. This means that you can’t simply use “elastic” or “plastic” material. You need to consider hardening with more care. If you will have loads only in one direction isotropic hardening is usually sufficient BTW. This load-time dependance does not only complicate hardening. This will also indicate, that you need to worry about low-cycle fatigue! In short, you will need to do more complex analysis that simple “static run”. This is not the topic of this flowchart… but be aware of this! All in all, if you have more or less a static load, the answer is “no”. Then, depending on a previous choice you will end up with plastic or elastic material. If the load changes in time, the answer is “yes”… and things just get a bit more complex! Note, that size of the “red zone” is of no consequence here. 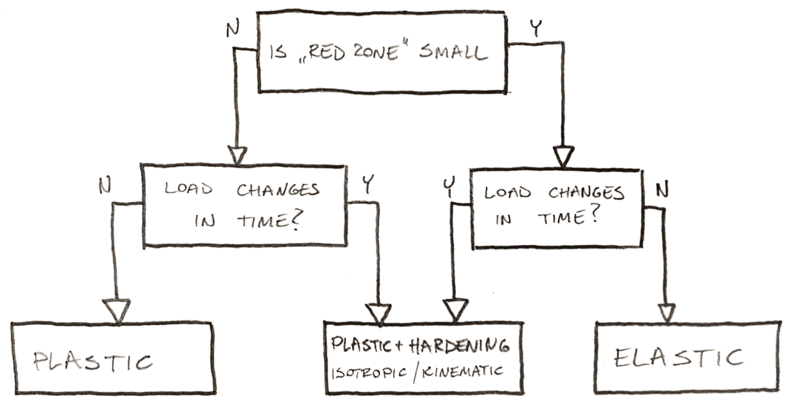 Of course, there is a bigger “chance” that all will be ok if the zone is small… but if the load changes in time, you can’t really ignore plastic material. After all, low-cycle fatigue can start in the smallest of places, from where the cracks will propagate! This is the second time where “red zones” will be used. But here I will be brief, as a lot depends on your material and it’s properties. All in all, if you have a hyperelastic material, but “red zones” are small similar considerations should be made to estimate if “red zones can be ignored”. Usually, hyperelastic materials can undergo insanely large strains, so this is somewhat comforting. However, catching nonlinear behavior clearly needs a nonlinear material model… so you will have to decide what you are up to! Congratulations… you have managed to read this all – I think this is the longest post to date! In this part of the #NonlinearFlowChart you have learned how to assess if the nonlinear material is required. You can also take a look here, for similar stuff with nonlinear geometry! If this was useful to you share it with friends that may enjoy this post as well! Want to learn more about nonlinear FEA? Did you know I also created a premium on-line FEA course? It includes videos – 24h! What are the Types of Elements Used in FEA? Correct mesh size – a quick guide! Geometrically nonlinear analysis – how does it work? Linear buckling in plain language! Get all new posts directly to your inbox.